Yoga is more popular than ever. Why? Yoga provides a total body workout that enhances strength, cardiovascular condition, balance and flexibility. It also enhances one’s body awareness, increases physical control and facilitates body mastery. Because it involves a highly comprehensive and integrated approach, yoga produces a longer, leaner and more graceful physique – also currently en vogue. Yoga also helps reduce stress, tension and fatigue through its mindfulness, often-fluid movement and deep breathing focus. Adopting yoga as a regular aspect of one’s life can be a daunting task. Yoga is well-known for being physically demanding and the infamous “yogis” are often portrayed as judgmental and intimidating. 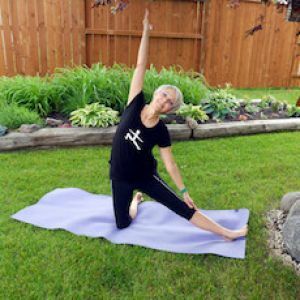 Here at YogaFit, we like to break down the process of beginning yoga practice into 5 easy steps, making it accessible to those looking for a major lifestyle change, as well as those simply looking to amp up their daily routine. 1. Breathe- As YogaFit founder Beth Shaw always says, “If you can breathe, you can practice yoga.” The deep breaths associated with yoga practice have emotional and physical benefits. As they help you gain a sense of relaxation the breaths simultaneously reinvigorate the circulatory and respiratory systems, instantly moving you towards a healthier, more balanced life. 2. Listen to your body- Yoga can be especially strenuous on the body during the first few months of practice. Try to be aware of the way that your body reacts to poses of various difficulty. When there is pain, it’s best to take a break and try again later. Serious injuries and muscle pulls will only cause setbacks. 3. Progress at your own pace- Each and every person on this planet is born with different natural levels of strength and flexibility. Because of this, progression in our yoga practice as well as the practice depends on our natural levels of ability and healing. Don’t compare yourself to those around you in class, your goals, as well as your practice are your own. 4. Rest as needed- Rest in an important and often forgotten part of any physical activity. The body needs time to rest and regroup so it is ready to face another day. When you are beginning your yoga practice, make sure to sleep well the night before your next class or training session. Your body will need the extra energy. 5. Stick to a schedule- Even if you’re in the middle of a particularly busy day, take a few minutes to fit in some mindful breathing and a pose or two. Staying consistent is always the best method for success and those moments will help you to clear your mind and work more efficiently.